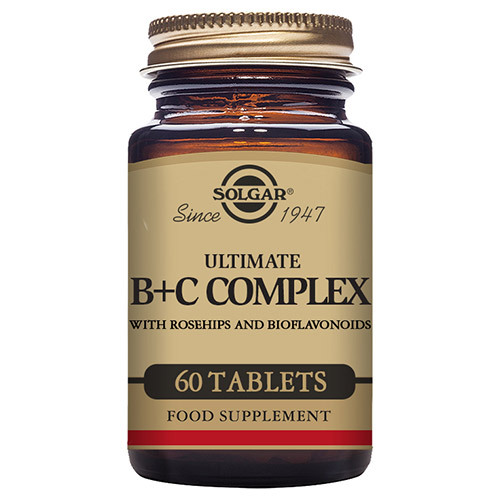 Solgar® Ultimate B+C Complex is a high potency Vitamin B and C formula with added rose hips and bioflavonoids. 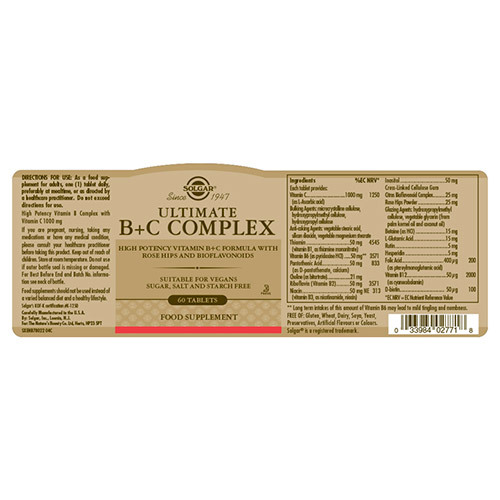 There are 8 vitamins in the B group, and Solgar has combined all of them for Solgar® Ultimate B+C Complex, creating a specialist formula for a complete approach to supporting the nervous system and energy metabolism. By adding Vitamin C, a holistic approach is taken to furthermore support the immune system. The B Vitamins play several roles in the processes which keep the body and mind healthy. Vitamin B1 (Thiamine) helps the metabolism to transform food into energy, and can be found in whole grains, nuts, and green leafy vegetables. Vitamin B2 (Riboflavin) supports in the protection of oxidative stress by combatting free radicals. It can be found in dairy products, eggs and spinach. Vitamin B3 (Niacin) assists in the reduction of tiredness and fatigue, and can be found in red meat and green vegetables. Vitamin B5 (Pantothenic Acid) can be found in almost every food group and assists the metabolism by breaking down fats and carbs into energy. Vitamin B6, mostly found in poultry, fish, cheese and carrots, helps to regulate the amino acid homocysteine, as well as regulating hormones such as serotonin and melatonin, which are related to sleep, stress and mood. Vitamin B7 (Biotin) is also called the ‘beauty vitamin’ due to its positive effect on hair and skin. It can be found in a variety of foods such as pork, chicken, fish, cauliflower and nuts. Vitamin B9 (Folate) is commonly known as ‘folic acid’ and supports the maternal tissue growth during pregnancy. Pregnant women are often advised to eat loads of dark leafy greens and root vegetables to make sure their Vitamin B9 intake is sufficient. Vitamin B12 is only found in animal products such as fish, meat and dairy, and there for those who are strict Vegan or Vegetarian will often be deficient. This vitamin is very important in the formation of red blood cells and supplementing is highly recommended for those who are not able to get adequate levels from their diet. Vitamin C is a water-soluble vitamin, sourced from natural ingredients such as rose hips and acerola. Rose hips contain bioflavonoids which naturally occur with vitamin C in nature. Bioflavonoids help to enhance the absorption and bioavailability so make sure you will receive all the benefits from Vitamin C.
Vitamin C is an essential vitamin that is only stored in the body in small amounts. This vitamin helps fight free radicals. Free radicals can lead to oxidative stress and the premature aging of cells. Vitamin C also helps maintain a healthy immune system and has multiple benefits to help to reach optimal health. 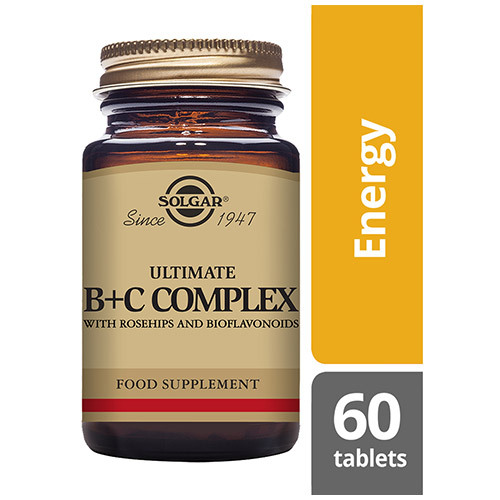 1 tablet a day of Solgar® Ultimate B+C Complex will give you a complete spectrum of the important Vitamin B and Vitamin C vitamins, for daily wellbeing. 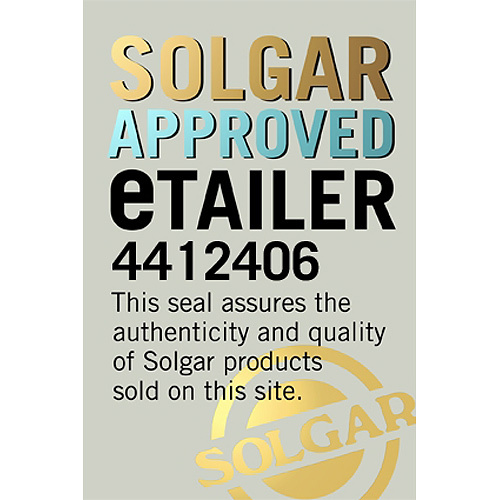 Also contains: Anti-caking Agent: vegetable magnesium stearate, silicon dioxide, Glazing Agent: hypromellose cellulose, Cellulose Gum, Colours: titanium dioxide, riboflavin, Vegetable Glycerin, Bulking Ahemt: hypromellose. As a food supplement for adults take one tablet, daily, preferably at mealtimes, or as directed by a healthcare practitioner. 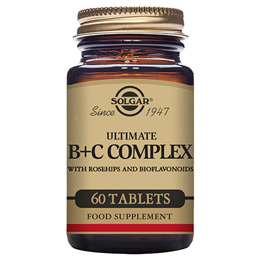 Below are reviews of Solgar Ultimate B + C Complex - 60 Tablets by bodykind customers. If you have tried this product we'd love to hear what you think so please leave a review.